Have a question on Odyssey? Odyssey is available in 6 different colors - Crystal Black, White Diamond, Deep Scarlet Pearl, Forest Mist Metallic, Modern Steel Metallic and Lunar Silver Emtallic. Watch latest video reviews of Honda Odyssey to know about its interiors, exteriors, performance, mileage and more. Originally designed and manufactured in Japan, this 5-door minivan by Honda Motors unveiled its first face in the year 1995. But initially, due to its imposing large dimensions and overall dynamics, it was not received very well in majority of the nations. Later on, as a result of which Honda produced better variant of the same car; smaller in size, packed in more utility features and elegant exterior profile. Thereafter to increase the production, Honda built another manufacturing unit of this car in Lincoln, Alabama and now it is one of the premier minivan available for UAE residents. If you are looking for a van then space, comfort and convenience would be your priority. Same is provided by Honda's minivan Odyssey which accommodates comfortable seating for 8-passengers at a time that can be altered into a complete room mode on slide-adjusting rear seats. For fun & entertainment, 8-inch display screen is provided that plays amusing stuff via audio, DVD, bluetooth, AM/FM/CD with ANC subwoofers and 7-speaker sound system. Also, multi-information panel is there to keep you updated for outside temperature, connectivity, fuel & other necessary details that can assist you for driving in supreme comfort. Tilt & slide sunroof function lets you enjoy morning hue of the sun and fresh light to get-in. With all seats in standard position, it offers a boot space of 259-litres that can be extended upto 1332-litres. This 5-door minivan is designed in the exterior profile as such to offer maximum space in interior cabins as well as maintaining the seemliness of the vehicle. Powerful headlights are integrated with high-intensity discharge (HID) lamps that offers better visibility of the road condition and pedestrians crossing-by in dark nights. Easy access to the rear cabin is facilitated by sliding rear doors which can be operated easily by remote key or switch. Overall dimensions of the van is measured as 5152mm x 2011mm x 1737mm (L x W x H) along with the wheelbase of 3000mm. Wheels of size 17 or 18 inch comes fitted with the tyre size 235/65 R17 and 235/60 R18 respectively. Honda Odyssey is powered with a 3.5-litre, V6 i-VTEC VCM (Variable Cylinder Management) engine that improves engine performance, acceleration and fuel economy of the car. It churns out maximum power output of 250 HP at 5700 rpm along with the peak torque of 344 Nm at 4800 rpm. It delivers fuel economy of 10.5 l/100km due to ally-performance of packed 3.5-litre engine, ECON mode and ECO Assist. Through Eco Assist you will be getting information about your driving mode, if driving smoothly indicator will turn green in color whereas cruising on high speeds, the indicator will turn blue. Coupled with 6-speed automatic transmission it gives acceleration of 9.0 seconds achieving 0-100 km/h speed with a top speed of 190 km/h. Traveling in the Honda Odyssey assures the safety of your friends & family. Ventilated disc brakes on front wheels and drum brakes on rear are fitted along with strut front suspension and rear double wishbone suspension that smoothen ride & handling of the vehicle even though traveling on uneven surfaces. Furthermore, ABS with Electronic Brakeforce Distribution and Vehicle Stability Assist (VSA) keeps check on your driving mechanism and helps in keeping the van in control. Front, front side & side curtain airbags with seatbelts and front active head restraints acts as part of passive safety system reducing effect of collisions. Rear view 3-mode monitor, Honda LaneWatch, immobilizer, front corner sensors, ISOFIX child anchor seats are few other safety aspects laden in this minivan. 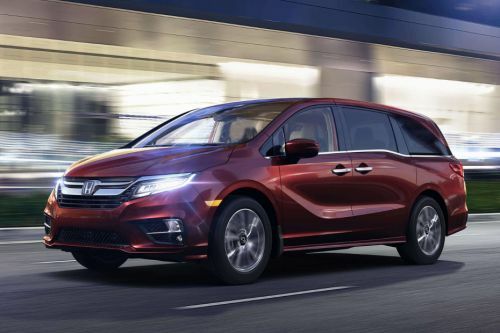 If you are looking for a powerful minivan, then Odyssey is a good take that offers you convenient and luxury features packed inside a powerhouse V6 engine it. Overall, the MPV is great but we would have appreciated a smaller engine as well for the mileage hunters. What is the price of Honda Odyssey? On road prices of Honda Odyssey in starts from AED142,900 for base variant LX, while the top spec variant Touring costs at AED174,900 . What are the colors options available in Honda Odyssey?